The Amish are very spiritual and morally set in the ways of their faith. Sadie Detweiler, courted by Harlan Mast, finds she is pregnant. Wondering how she will face her family, she strongly believes Harlan will ask for her hand in marriage sooner. Imagine her surprise when Harlan denies being intimate with Sadie. Hurt beyond compare, she is shunned by her parents who believe Harlan's lie. They send her to live with distant relatives in Kentucky, far from everyone she knows and loves. Heartbroken, Sadie is determined to start a new life for herself and the baby. After many hours of traveling by bus and with only five dollars to her name, Sadie finally arrives in her new town. She is surprised to discover she is to reside in a tiny and decrepit home with Willis and Verba Stauffer and their grown children, Stephen and Esther, and Stephen's son, Monroe. More disturbing is that Esther and she must sleep on cots in the kitchen having no privacy. Something strange is happening with the Stauffers and tension abounds. Verba becomes ill; 911 is summoned and she is whisked away. One of the EMTs, Noah Freeman, who is also Amish, notices a timid and shy Sadie hunkering in the shadows. There is something about her he is attracted to. They leave Verba at the hospital and return to the fire department, soon learning Verba passed away. The woman, suffering from stomach pains, did not appear to be critical. Noah finds this unusual and is bothered by her death. Something tells him she was poisoned. Concerned by Verba's demise, Noah goes to the Stauffer homestead to pay his respects and also hoping to talk to Sadie and get to know her better. He is unprepared for the harsh welcome he receives but feels the need to see Sadie. Noah gets his chance when Esther and Sadie are in town shopping. He spies Esther waiting outside the store and lingers for Sadie to come out. Asking her to have some pie with him at a nearby eatery Sadie hesitates, though Esther begs her to go saying she wants to meet a friend. She accepts Noah's invitation, enjoying her time with him, yet she is fearful about mentioning she is pregnant. What man would want her in her condition? "What could she say? It wasn't like she knew what to expect during a pregnancy or had anyone to talk to about it. So far, all she'd been focused on was having a place to live. Not only confused and wounded by the rejection of her parents' and the man she thought she would marry, Sadie must deal with living with people she doesn't know—people who give the impression of being hostile and uncaring—as well as handle a pregnancy alone. How much more pain can she take? As time passes it's clear Sadie's kinfolk are up to something shady, which only frightens her more. With nowhere else to go, she is happy Noah cares for her wellbeing, offering her some comfort. 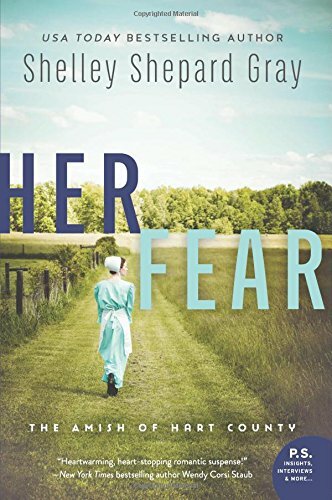 Her Fear, Shelley Shepard Gray's fifth addition to her Amish of Hart County series, delves into the personal life of an unwed mother with the fears and battles she faces. The knowledge she imparts of the Amish community opens readers to an inside look as to how they live a plain and frugal life, though they too suffer the same worries, concerns, and troubles as the "Englisher." Easy and delightful reading, this novel offers suspense and mystery as well as the heartwarming reality of a young woman's life.